"A blueberry coffeecake with a ricotta cheese topping. Reminiscent of cheesecake, this recipe was in my maternal grandmother's collection. Origin is unknown." Preheat the oven to 350 degrees F (175 degrees C). Grease a 9 inch square baking dish. In a large bowl, stir together the flour, 3/4 cup of sugar, and baking powder. Add the milk, shortening, 1 egg, and lemon extract, and use an electric mixer to mix on low speed for 1 minute, then on medium speed for 1 minute. Pour the batter into the prepared pan, and spread evenly. Sprinkle blueberries over the batter. In a medium bowl, stir together 2 beaten eggs, ricotta cheese, 1/3 cup of sugar, and vanilla extract. Spoon this mixture over the blueberries, and spread evenly. Bake for 55 to 60 minutes in the preheated oven, until a knife inserted near the center comes out clean. Cool completely before cutting into squares and serving. See how to make streusel cheesecake with delicious blueberry muffin flavor. This recipe was superb! It was moist and delicious. The only changes I made were to use frozen blueberries and 1/2tsp of lemon juice since I didn't have any lemon extract. A keeper for sure. 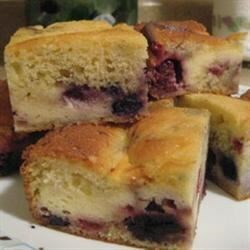 This was a great recipe idea for blueberry's, if you're tired of the muffins & pies. I used Splenda in place of all the sugar and it turned out great!